Most of our eBooks can be read on devices (tablets and smartphones) running Google's Android operating system. To do so, you need to purchase the EPUB version of a title and install an EPUB-based reader, such as the Aldiko eReader detailed here, on your device. There are several eReader programs available for Android devices, and one of the most popular is Aldiko. This is a free application that can read eBooks in the EPUB format. Aldiko is available in a free ad-supported version or a $2.99 ad-free version. To download Aldiko to your device, go to the Android Market and search for "aldiko." Follow the onscreen instructions to install the application. Note that as of version 2.0, Aldiko can read PDF files as well as eBooks (PDF and EPUB) protected by Adobe DRM. 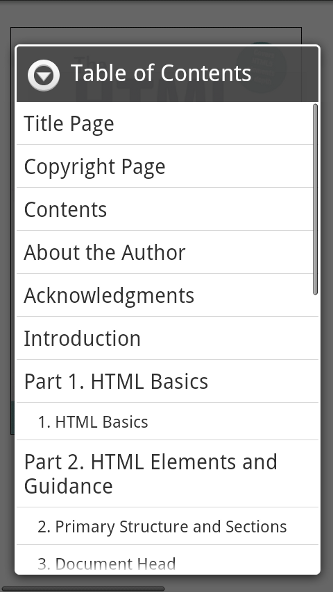 When available, you want to purchase the EPUB version of a book to read on your Android phone. If an eBook is available in EPUB format, you'll see a link similar to the one below. Click the Buy button to purchase the eBook. Navigate to the Import folder in the file window for the Android. You can now copy the eBook file from its home on your computer to the eBooks/Import folder on the Android. Disconnect your phone from your computer and open the Aldiko application. From the Aldiko's Home screen, press your phone's Menu button and then select Import. From the next menu, select Import again, then select OK. The new eBooks you just added will now be imported into the Aldiko application. When you launch Aldiko on your Android phone, you see the Library, a virtual bookshelf that holds all your purchased titles. You can scroll through multiple bookshelves to view all the books you've downloaded. Tap a book cover to begin reading. 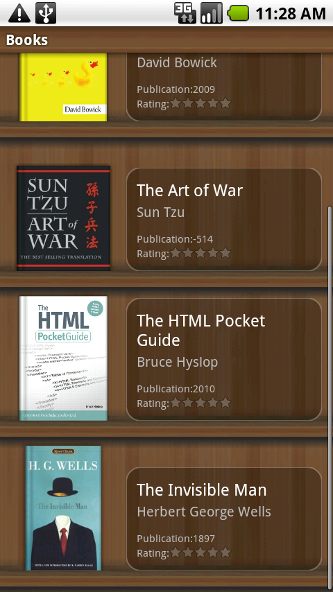 The Aldiko bookshelf on an Android smartphone. To turn to the next page in a book, swipe your finger across the current page to the left, or just tap the right side of the screen. To return to the previous page, swipe the page to the right, or tap the left side of the screen. Viewing an eBook's Table of Contents. To search for a specific word or phrase, click the Menu button, click the More button, and select Search. When the Search screen appears, enter the term you're looking for. All instances of the word or phrase are now listed; tap an instance to jump to that point in the book. To change the size of the onscreen text, Click the Menu button and select Settings. 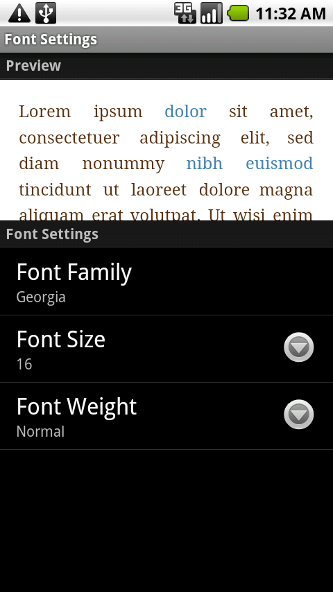 From the Settings screen, tap Font Settings. You can then the point size and weight of the text, as well as the font family used to display the text. Changing the size of onscreen text.